STANLEY STORIES: From Kookie #2: Innocent Hepster 'Kitten' Invades World of Desperate Bohemia; Middle-Aged Oglers Descend; Fiscal Surprise For Alleged "Artiste"
From Kookie #2: Innocent Hepster 'Kitten' Invades World of Desperate Bohemia; Middle-Aged Oglers Descend; Fiscal Surprise For Alleged "Artiste"
Those of you who remember the prior incarnation of this blog (as a website) will recognize this story. Even so, I hope its reappearance is welcome. Here is a prime example of John Stanley's "shrill sitcom" style of the early 1960s. 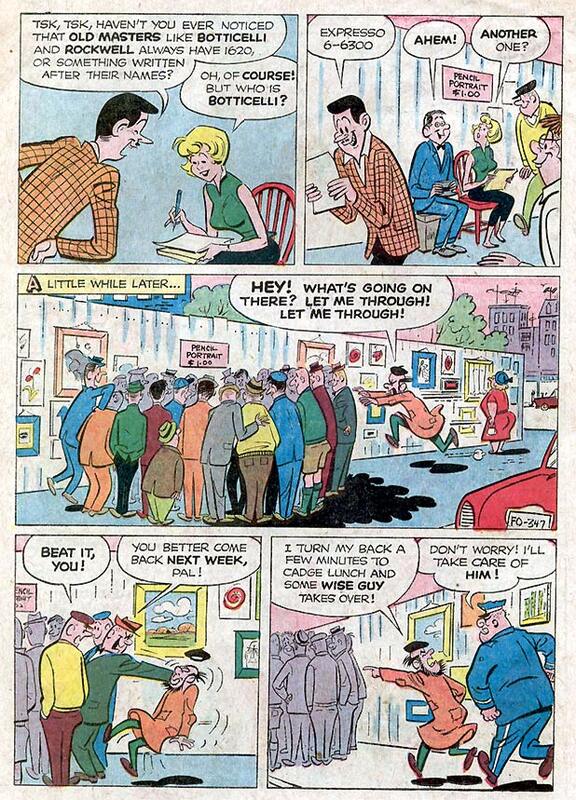 This was from a failed collaboration with the brilliant cartoonist Bill Williams. Kookie shoulda been a big hit. 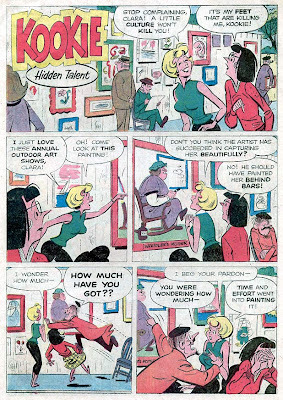 It was the comix equivalent of the hip TV sitcom The Many Loves of Dobie Gillis, albeit with better writing and in living newsprint color. 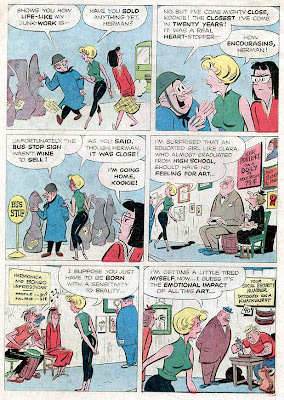 With Kookie, Stanley threw himself into current events--current by comic book standards. 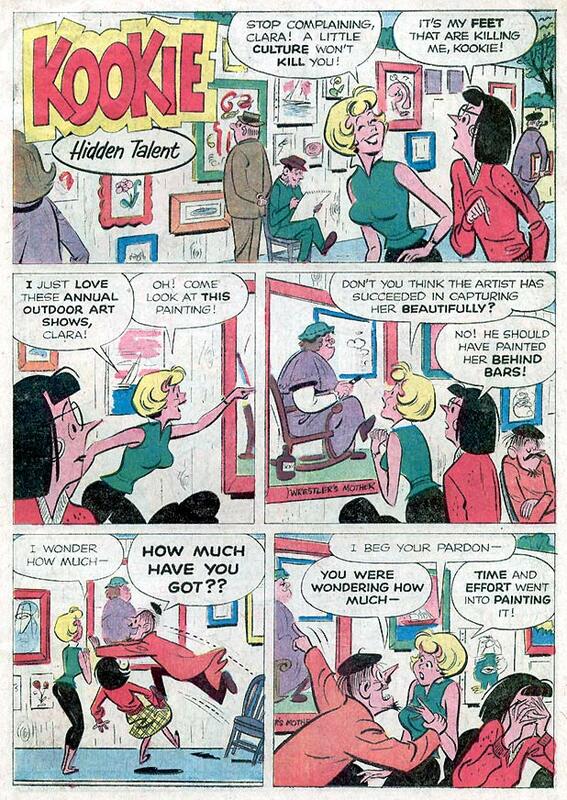 By 1961, the whole "beat" thing was, like, exitsville in real-life. On TV, and in this and a few other funny-books and movies, bushy-bearded hipsters with snappy patois, filthy, disheveled duds and a "like, man, I don't care! Dig?" attitude seemed to rule the world. Kookie was John Stanley's take on the coffee-house scene. The book seems to be aimed at older readers. Beautifully executed, with delightful flashes of anarchic behavior, poor Kookie never had a chance. Dell canned it after its second issue. Sales must have been miserable. It seems that most new titles had three issues in which to prove themselves. How could such a high-concept comical book have missed the mark? Perhaps, by aiming for an older audience, Dell and Stanley shot an arrow into a void. 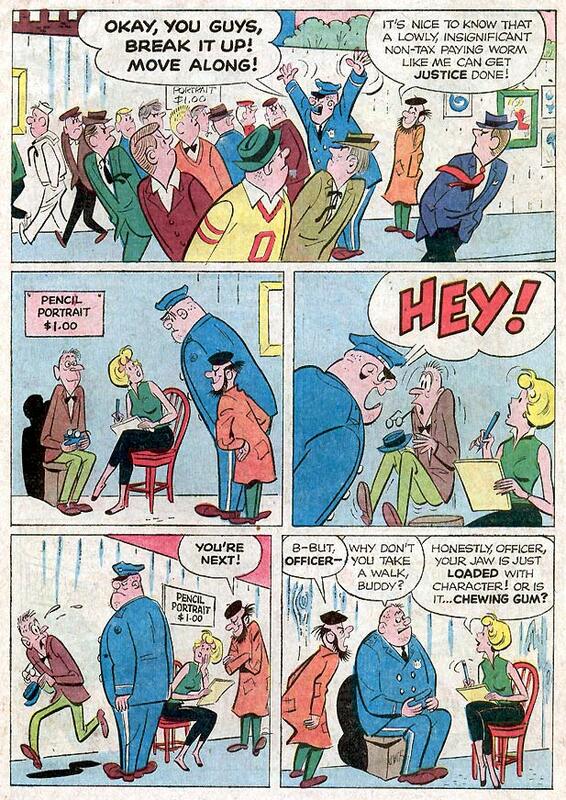 As you'll see by this selection from the second/last issue, "Hidden Talent," Stanley and Williams offered bullet-proof, high-functioning sitcomix. Stanley got to renew an old grudge against "fine artists" evident as early as 1944 in his comix work. Kookie attempted to build a truly eccentric world, with a colorful cast of characters. In this dowdy ensemble world, no one figure is truly the star of the show. 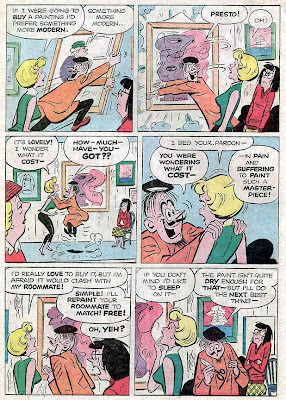 An extension of Stanley and Williams' Dunc 'n' Loo concept, Kookie was launched a few months after that earlier title's debut. 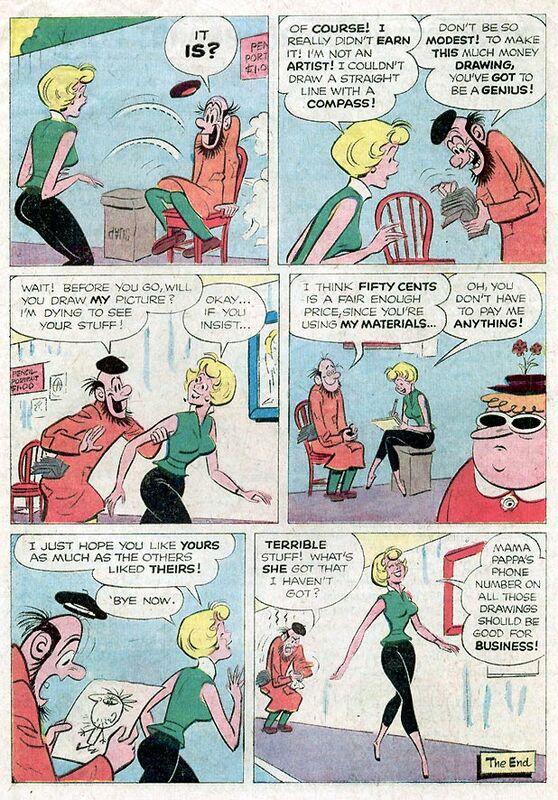 At this time, Dell upped the price of their comix to 15 cents. 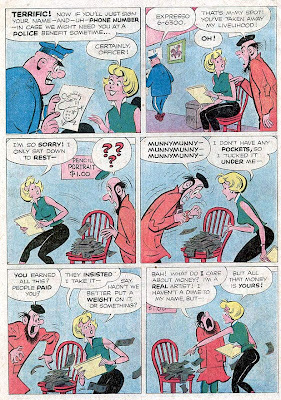 While their books were ad-free, and offered value for money to the space-age comix fan, this higher price served them about as well as it did when EC Comics asked the same price for their prestige title, Weird Science-Fantasy, in 1954. This may have been the agent in Kookie's premature demise. 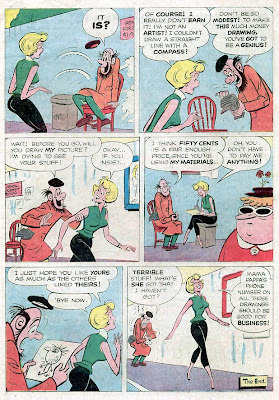 With the book's ambitious higher aim, the extra nickel, and the unfamiliarity of the series, may have been too rich a concept for the 1962 comix reader. 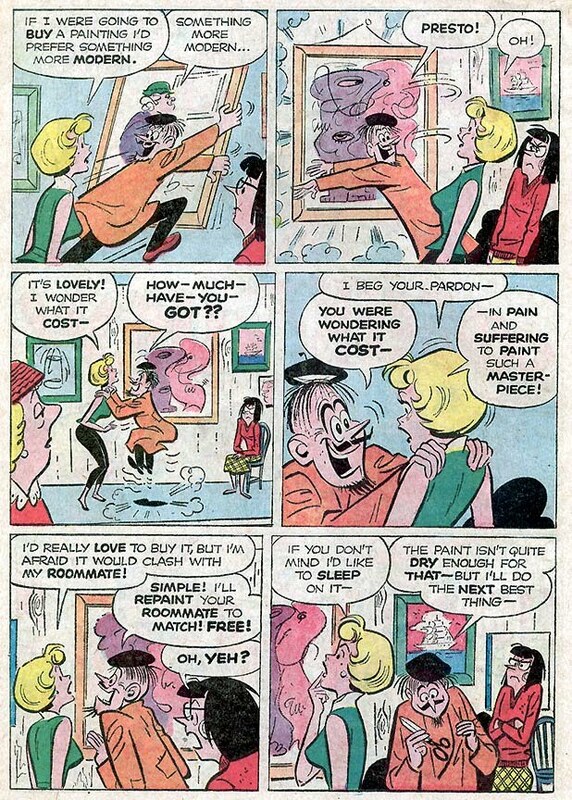 Kookie had the potential for comix brilliance. 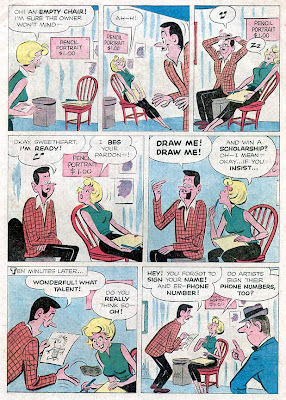 As I've said before, Bill Williams was the finest cartoonist who worked with John Stanley. 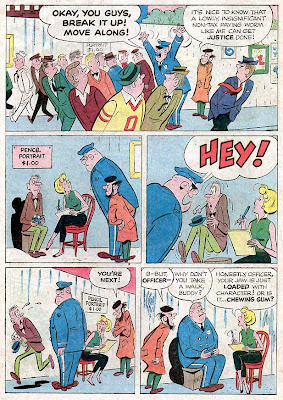 His stylish, personality-filled figures and lines sell Stanley's comedy 110%. Given the exotic Greenwich Village trappings, Stanley let the zanier side of his wit loose here. The playful, brassy absurdity of "Hidden Talents" has enormous charm. 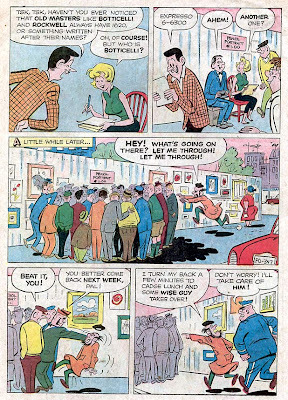 In a past post on Stanley's last comix work, O. G. Whiz, I noted a similarity to the early work of underground cartoonist Gilbert Shelton. This story has that same vibe in its less hysterical moments. In the early '60s, Stanley honed in on a certain style of comedy that strongly prefigures the best of the funny undergrounds. 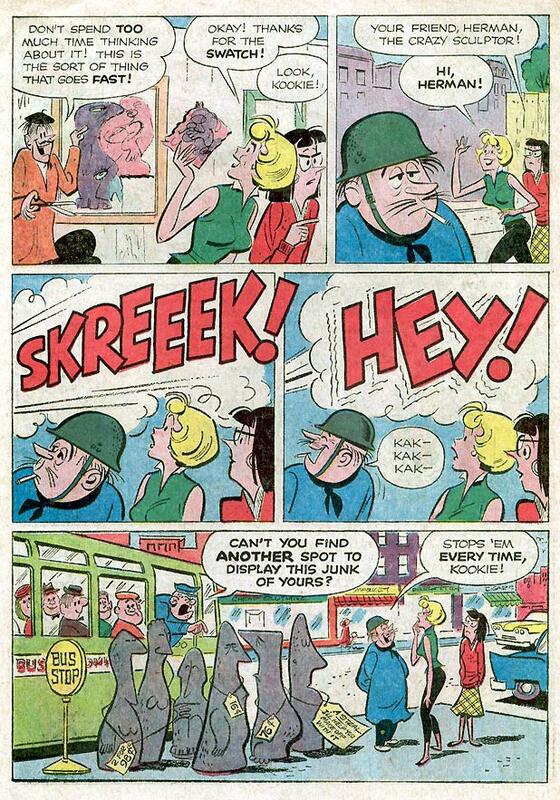 I would be genuinely surprised if Shelton, Frank Stack, Justin Green, or other practitioners of the more sublime underground comix wit saw Kookie, or Stanley's other 1960s/1970s work. Because it was mainstream newsstand stuff, it may have been dismissed outright. If only Stanley had found success with the likes of Kookie! 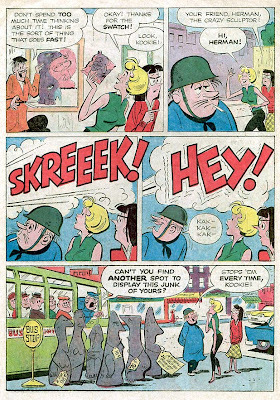 It might have fostered a new school of mainstream comix that appealed to older readers, had more current themes, and helped move comic books out of their Warsaw ghetto on the pop-culture scene. Instead, Kookie was just a flash in the pan. Stanley boxed up the lighter side of his comedic wit for the duration of the 1960s. While his "auteur" titles, 13 Going On 18 and Melvin Monster have much to recommend them, they are almost devoid of the playful exuberance that distinguishes Kookie. 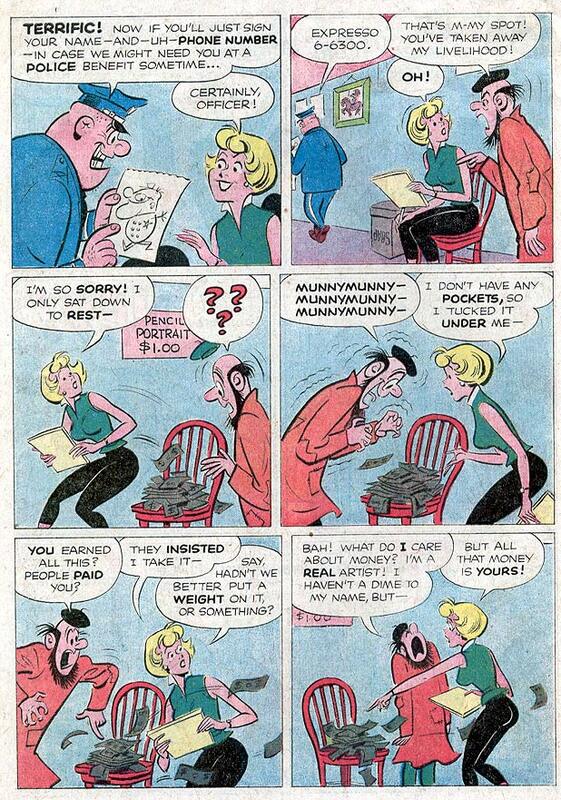 This eccentric utopia is among the saddest losses in comix history. i have read this before but i'd like to read it again more than anything, but the pages will not expand...BAW!!! They expand fine on my computer--and I tried 'em out on a friend's laptop, too. The scans are a bit smaller than normal. Try double-clicking on them; that might do the trick!